I must have been around 19 when I first read Kahlil Gibran‘s words ‘On Children’. The opening line, ‘Your children are not your children‘, never ceases to amaze me. There’s a certain catching of the breath followed by a soft exhalation and with it comes the knowledge that what he says is not only true, but so beautiful. It’s like a warm embrace, this poem by Gibran. You know that feeling when you go home to your mom, sit up on the kitchen counter, your legs swinging off the side of it, while she carefully measures out your tea in your favourite mug, with just a spoonful of sugar, just the way you like it? That’s the feeling I get when I read this writer. I’m a largely introspective person, as you can tell if you’ve been reading this blog of mine for some time now. Interestingly, my parenting journey, too, has been helped along this path thanks to Gy. Sure, I’ve lost my temper, snapped irritably when things didn’t go my way, sulked when I couldn’t sleep in beyond 6 am on a school morning, but the point is, I am learning as I walk this path. Being a mother to a growing young girl comes with its own share of challenges and epiphanies. When I read this poem back in my teens, I marveled at the fluid language and the depth of emotion that was captured so beautifully. Today, when I read it, I can feel the way he reaches into my soul and touches upon that almost imperceptible feeling called motherhood. Isn’t it incredible how we try to hold onto or wield a certain power over our kids? We don’t intend to do it, but every time we say ‘I know better’ or ‘Just listen to me’, we inch closer to the idea of control. The scary bit? It only gets tougher as they grow older. They morph into these tiny selves that know what they want and aren’t afraid to show it. Gone are the days of the cuddly babies who hung on your every word. It’s time for Ms.Personality to make an appearance. It’s hard- that transition. For them and for us, it is a leap of faith into the unknown. Somewhere, somehow we can just hope that someone is out there, waiting to catch us. Every time I read Gibran, I am confident that there really is a higher power to do just that. Letting go can be hard, but we need to. Most importantly because, our kids need it. An amazing quote and poem. Yes, they are not ours to keep. But you know what, I feel that in our journey as parents there are phases when we do know better, when they need discipline and boundaries. Then as they grow older we start loosening that control. In my opinion, I am a parent first and foremost, a friend later. Beautiful poem and a beautiful post! S, every time I read your post, I fall in love with you and your style of expressing your innermost thoughts with such an amazing simplicity and truthfulness! I could read this one a hundred times and still feel hungry for more! Thats beautiful poem. And i guess, we need to let them go and become independent. Its a great quote ! always loved Kahlil Girbran and its a challenging quote for parents…. to love children deeply and at the same time assert and help them evolve as independent persons, requires a lot of patience and understanding.. I don't know if I know better, as a parent. But yes, it's quite difficult to let go. Yet, we need to, I suppose. I suppose if you can find the perfect mix of 'letting go' and 'tightening your hold', that's what counts. Beautiful lines, explicitly ellobarated by ur thoughts on them. When I wonder why my girl isn't like me, I try seeing the benefits of not being me. But I can say out of experience that though kids tend to ignore u, every word sinks into their head and some day they realize it's values,like we did after we grew up to be parents ,and would start practicing them. Happy parenting! I have often suffer from guilt … of not seeing my parents for so long. Although they sound as if it's cool even if it's an empty nest back home, but I know how much mom would love it,if we all were staying together, under the same roof. Breaks my heart if I start thinking too deep into it. Letting go is tough, tougher for parents. Letting go, the control freak in me says “No way! You cant do it.” but the Mom in me says, “You have to let go, Let him live his life”. Most of the times Mom wins, some times the Control Freak does, so all in all it is pretty balanced as of now. I wonder though what happens when he grows older? Thank you, Lata. Yes, it's harder than it sounds. Oh yes indeed. I doubt most of us can really cut the ties that bind, but to step back and watch them do what they can is another surreal feeling all its own. I'm getting there, slowly but surely. That is the balance we must strive for, Angela. Thank you so much! That mix, the balance, the Zen, is what we all strive for every single day 🙂 Thank you, Sid! Such profound and beautiful words. Oh yes, letting go is a struggle for most parents and that is what creates issues later in their lives! 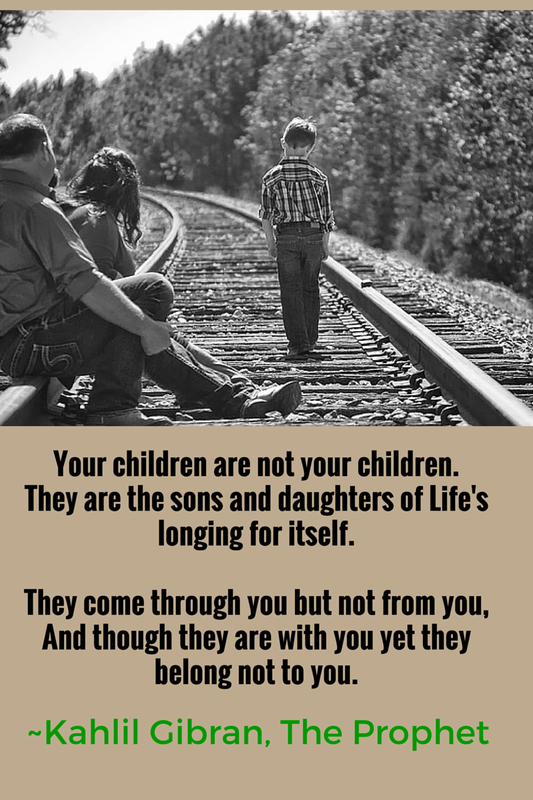 While as kids we need to guide/guard/protect them, but as they grow older… giving them wings/freedom and stepping back should be the way forward! Yes, waiting for that 'some day' seems like an uphill task on most days, Vaishnavi, especially when that germ of defiance rears it head. I hope and pray that she will realise the value when the time is right. Thank you for reading. We're always learning, Jaibala. It's tough, I tell you. I sometimes feel we've been thrown in the deep end and asked to swim for dear life 🙂 But we'll figure it out. I promise. Just love Gibran, and the way you have worked this quote is beautiful…..
Hey Santosh 🙂 Thank you so much for reading and commenting. Equally lovely meeting you too!